It’s the end of October, which means the end of my month of spooky/thriller-y/creepy/fall-ish reads. 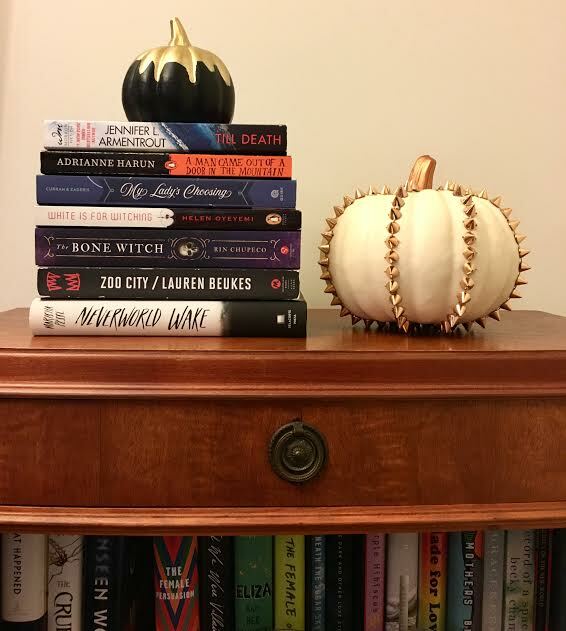 I definitely had some fun with my reading this month, although my ratings were all over the place, and I think I got my fix of October-type books for the year. I had a great time participating in Dewey’s 24-hour Readathon this month, and today I dressed up as Hermione Granger for Halloween, which was super fun. Now we’re on to November and NaNoWriMo next, so my wrap-up for next month likely won’t be nearly as impressive as this one is. White is for Witching by Helen Oyeyemi (5 stars) – White is for Witching was one of those 5 star reads that sneaks up on you; I wasn’t expecting it to be as impactful as it was. It’s a dark, creepy, unsettling, and strange book that’s fascinatingly and intricately composed. Oyeyemi’s writing is beautifully strange and meandering, following the living as well as ghosts, making you question what’s real and what’s not. She also tackles themes of racism and xenophobia in unexpected ways. White is for Witching follows Miranda, a girl who suffers from pica, a compulsion to eat what’s not food. As she devours chalk and plastic, she grieves for her mother and is haunted by a house with a past—a past that seeks to encompass her too. I don’t want to reveal too much about the story, because learning its aspects is part of the experience of this book, but I highly recommend this to readers of magical realism or literary fiction who are looking for something to put them in the October mood. My Lady’s Choosing by Kitty Curran and Larissa Zageris (4 stars) – This book is SO MUCH FUN! If you enjoy Jane Austen and/or the Brontes and/or historical romance or romance in general, I highly recommend giving this book a shot. I wasn’t sure when I bought it whether it was my kind of thing, since I’ve never really read historical romance, but I found that having read a bunch of Jane Austen (as well as Jane Eyre) was a solid enough background to catch a lot of the references in this book. Basically, it’s a choose-your-own-adventure historical romance, where you are the heroine and must make decisions every few pages. There are 4 main storylines that you can follow, but each has a bunch of twists and turns and involve a mystery in addition to the romance storyline. In general, the four storylines revolve around either a Mr. Darcy-esque figure; a female adventurer; a Mr. Rochester-esque figure; and a Scottish guy, but there are other endings and romantic options in each of these stories beyond the main character. The book doesn’t take itself too seriously, and there’s a lot of humor and parodying of historical romance tropes; I laughed out loud so many times while reading this that I couldn’t read it in public. If you’re looking for a fun, lighthearted read (or a good book for a readathon!) I highly recommend picking this one up. Neverworld Wake by Marisha Pessl (4 stars) – This book is strange, immersive, and claustrophobic at times, which makes it perfect to read in one sitting. Five teenagers, best friends, are in a car accident and find themselves hovering in what’s called a Neverworld Wake, a sort of in-between time loop between life and death. They’re trapped there, reliving the day of their accident, until they can bring themselves to vote unanimously for the only one of their group who will survive the accident. No one can agree on who deserves to survive, so they end up reliving their day in all sorts of crazy ways until they agree that they need to focus their time instead on the unsolved murder of the other member of their friend group, which took place a year earlier. I thought the writing was great, and I enjoyed the strangeness and creativity that went into the book’s concept. I wouldn’t say that I loved the ending, but I’d definitely recommend the book overall. Till Death by Jennifer L. Armentrout (3.5 stars) – I’ve read a few Jennifer L. Armentrout books before (White Hot Kiss, the first two books of A Wicked Trilogy) and when I was at BookCon, I saw that she was going to be doing a signing and giveaway of this book, and luckily I was able to get in line while that was happening. Till Death is my favorite of hers so far; it’s a tightly written romantic thriller with a main character you’ll love and want to root for. It follows Sasha, who was abducted by a serial killer at nineteen and was the only one of his victims to escape, after which he killed himself. Ten years later, Sasha is finally mentally and emotionally ready to return to her hometown to help her mother run a bed and breakfast, but then creepy things start happening to make her wonder if the past is really over. Luckily, she also runs into her ex, who’s now a very attractive FBI agent. I don’t read a ton of thrillers, but this one was perfect for binge-reading and had a good mixture of thriller and romance elements. Sadie by Courtney Summers (3.5 stars) – This is a book that’s definitely best listened to as an audiobook. It alternates between the perspective of Sadie, a girl whose younger sister was murdered and who is now on the hunt for her killer, and a true-crime podcast tracking Sadie and her sister’s story. Because of that, I found this really easy to listen to, since podcasts are normally easier for me to pay attention to than audiobooks. I didn’t think it was a perfect book; I wished it was more complex, and the ending was a bit anticlimactic, but overall it was definitely a good listen and a creative storytelling method. A Man Came Out of a Door in the Mountain (3.5 stars) – This atmospheric book is hard to categorize in terms of genre. It follows a group of friends in a Northwestern town besieged by poverty and bad people–and that’s before the devil shows up. It deals a lot with violence against women and discrimination against indigenous communities, and according to the author’s acknowledgements “was sparked by outrage over the ongoing murders and disappearances of aboriginal women along Highway 16, the so-called Highway of Tears, in northern British Columbia.” The supernatural element was creepy and well-done, but I felt like the book could have been longer and developed its themes more fully. A Duke by Default by Alyssa Cole (3 stars) – This was a fun contemporary romance about a woman who takes an internship at an armory in Scotland and ends up falling for her gruff instructor. I liked the heroine, Portia, quite a bit–she’s interesting, flawed, and easy to root for–but I wasn’t quite as much of a fan of her love interest, who for me was sort of a standard grumpy romance novel dude. I do think I’ll check out the other two books in this series, because overall I enjoyed Cole’s writing and I liked the snippets we got of Portia’s friends, who are the main characters of books 1 and 3. The Haunting of Hill House by Shirley Jackson (2.75 stars) – I…wasn’t impressed with this one. I keep wanting to like Shirley Jackson, but somehow her books/stories just don’t seem to quite click with me. This is probably going to be the last one I try; sometimes an author just doesn’t work for you, and that’s OK. The premise of this book is that a professor studying the arcane convinces three other people to accompany him to stay at Hill House, a notoriously malevolently haunted house, where the four of them will proceed to observe and study what happens. We primarily follow Eleanor, a sheltered 32-year-old who has spent most of her life caring for her sick mother, who has recently passed away, and are also introduced to Theodora, a free spirit, and Luke, the sketchy heir to Hill House. The biggest issue I had (probably?) was that I found all of the main characters very unlikable, but not in interesting or compelling ways. The four of them proceed to encounter various supernatural phenomena and learn about the story of Hill House, but this doesn’t happen very interestingly either, in my opinion. There were some well-written passages, and a few attempts at humor did really work for me; I was more interested in the book as a whole at the beginning, when I thought that the more interesting parts were yet to come. Unfortunately, in my opinion, the buildup just didn’t really go anywhere that interesting until the very end, which I sort of liked some aspects of. Zoo City by Lauren Beukes (2.5 stars) – I really liked the original premise of this South Africa-set urban fantasy: when a person commits a serious crime, they magically obtain an Animal, which is sort of a companion and living representation of their guilt. There are a lot of theories about why this is happening and when it first started, but when the book is set, those with Animals are being driven into slums and have difficulty finding good jobs and homes (and in some countries are killed or imprisoned). The Animal is also sort of a guardian against a mysterious and deadly force called the Undertow, which takes a person if their Animal is killed. It’s a very unique premise, and I liked learning about all of the aspects of this concept, but unfortunately I didn’t like the story itself nearly as much. I found all of the characters to be very unlikable, but not necessarily in interesting ways (I don’t mind unlikable main characters as long as they’re done well) and the story meandered quite a bit before (in my opinion) a really unpleasant and unsatisfying ending. I wouldn’t really recommend this one, and I don’t think I’ll be picking up more from this author in the future. I like urban fantasy and am always looking for UF with a unique premise, but this was a disappointment for me. The Bone Witch by Rin Chupeco (1.5 stars) – Honestly, this book was a disappointment. YA fantasy can be very hit or miss for me, and this one just didn’t work. The premise of the book and its direction were very promising, but I just didn’t feel that it was executed well. There was a lot of infodumping, and the majority of the conversations between characters were also just infodumps in disguise; very little plot or character development happened over 400+ pages. I almost DNF’d it a few times, but kept hoping that things would pick up. Unfortunately, it’s not one I’d really recommend.